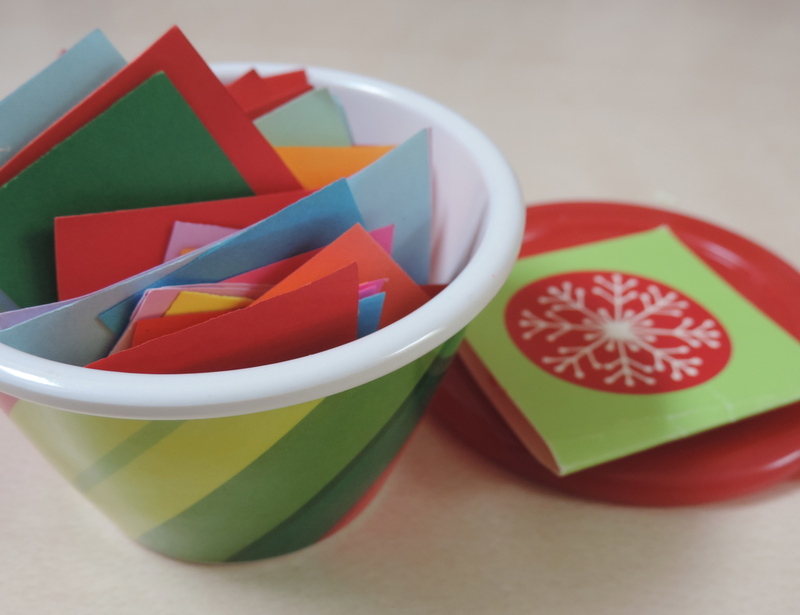 In November 2013, I wrote a post called "Create a Gift Box — For Yourself!" A month later, I received a gift from a dear friend and colleague, Lynnette Rumble of Aim Coaching, who had read my blog. She told me she was so inspired that she gifted her family, friends, clients and colleagues with a personal gift box filled with blank pieces of brightly-coloured paper. And that included me! Turns out that this really is a great gift! I created a tool to appreciate the present, to take steps, and to inspire personal action. Oftentimes, taking action can feel like a long list of to-do’s and obligations resulting in, you guessed it, procrastination. No matter whether we are forced into a transition of some type - career, retirement, residential, health, relationship - or whether we are planning to make a change, taking steps forward can awaken and stir our Saboteur’s negative self-talk and self-limiting beliefs. Using tools, strategies, and supports are helpful to get us out of our own way. This is where the “gift box” comes in. So back to my personal gift box — where and how to start? The first step was to make a decision about how to use my gift box of notes. I played around with options and ideas, and decided to write a daily note, recording something I wanted to celebrate, acknowledge, or appreciate about that day. It might be an insight, an action I took or accomplished, or what I felt grateful for. I wanted to include my core personal values so that I could track the ones I was honouring most (and least) often. I now had a small box with squares of blank note-paper. I needed to figure out the next steps: where was I going to put my written notes? And what would I do with them once I had handfuls and more? Tools are important, even necessary, in helping us to take action. When they are really good, the tools themselves can inspire us to explore and learn. Why not also use tools that are fun and lighthearted too? I decided I wanted mine to be colourful and creative too. Being a huge fan of old-school pen(s) and paper(s), I used a large canister to hold my written notes and a large sheet of bristol board to paste them on. 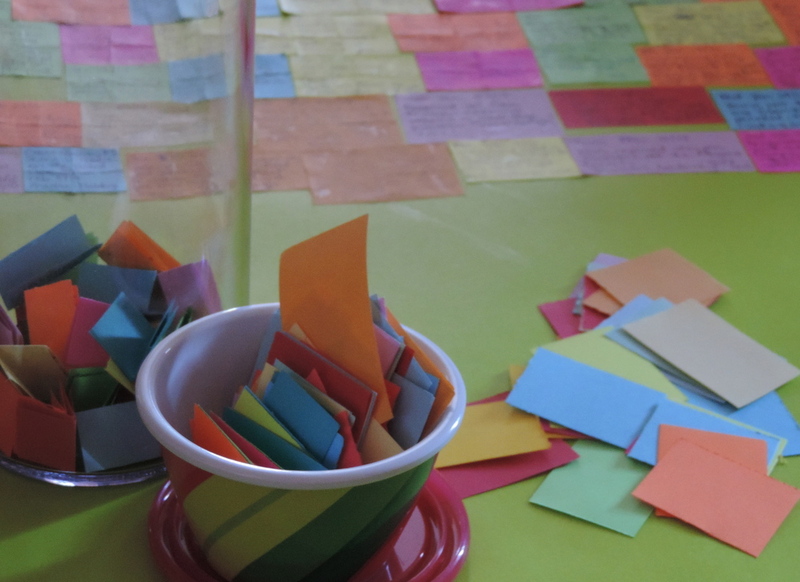 As you can imagine, seeing the colourful notes pile grow and the board fill up is very rewarding. In both life and transition coaching, taking action is important as is the reflective process that comes with taking that action step, or in the attempt to do so. This is when we deepen our self-awareness of our Saboteur and our deepest self. And this is where personal growth happens. acknowledging and celebrating the baby steps that I am taking. Wow! Reflecting on this list of what I have already gained from this process is powerful. It takes me out from the daily details and tasks to the big-picture meaningfulness, importance it has in my life. I will return again with another update and more reflections. In the meantime, have you created a gift box for yourself yet? I'd love to hear from you if you have or if you want help getting started.